I am a proud American who has had the pleasure of working with the law enforcement community for the past eight years. As an independent researcher, I have assisted on numerous local, state, and federal cases and trained many of our federal and military agencies in digital forensics (including breaking numerous encryption implementations). Early on, there was a time when my skill set was exclusively unique, and I provided assistance at no charge to many agencies flying agents out to my small town for help, or meeting with detectives while on vacation. I have developed an enormous respect for the people keeping our country safe, and continue to help anyone who asks in any way that I can. With that said, I have seen a dramatic shift in the core competency of law enforcement over the past several years. While there are many incredibly bright detectives and agents working to protect us, I have also seen an uncomfortable number who have regressed to a state of “push button forensics”, often referred to in law enforcement circles as “push and drool forensics”; that is, rather than using the skills they were trained with to investigate and solve cases, many have developed an unhealthy dependence on forensics tools, which have the ability to produce the “smoking gun” for them, literally with the touch of a button. As a result, I have seen many open-and-shut cases that have had only the most abbreviated of investigations, where much of the evidence was largely ignored for the sake of these “smoking guns” – including much of the evidence on the mobile device, which often times conflicted with the core evidence used. The Burr Encryption Bill – Discussion Draft dropped last night, and proposes legislation to weaken encryption standards for all United States citizens and corporations. The bill itself is a hodgepodge of technical ineptitude combined with pockets of contradiction. I would cite the most dangerous parts of the bill, but the bill in its entirety is dangerous, not just for its intended uses but also for all of the uses that aren’t immediately apparent to the public. 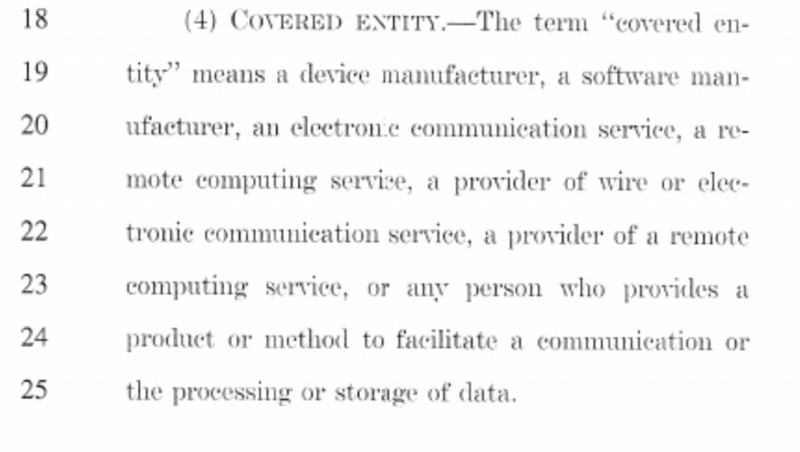 The bill, in short, requires that anyone who develops features or methods to encrypt data must also decrypt the data under a court order. This applies not only to large companies like Apple, but could be used to punish developers of open source encryption tools, or even encryption experts who invent new methods of encryption. Its broad wording allows the government to hold virtually anyone responsible for what a user might do with encryption. A good parallel to this would be holding a vehicle manufacturer responsible for a customer that drives into a crowd. Only it’s much worse: The proposed legislation would allow the tire manufacturer, as well as the scientists who invented the tires, to be held liable as well.